PLDT And Globe Agreed To Lower Voice Call Rates By Almost 40 Percent! Home / news / pldt / services / PLDT And Globe Agreed To Lower Voice Call Rates By Almost 40 Percent! Great great news! In support of this government's mission, PLDT agreed to lower its interconnection charges for voice call to Globe Telecom mobile phones and fixed lines by almost 40 percent! 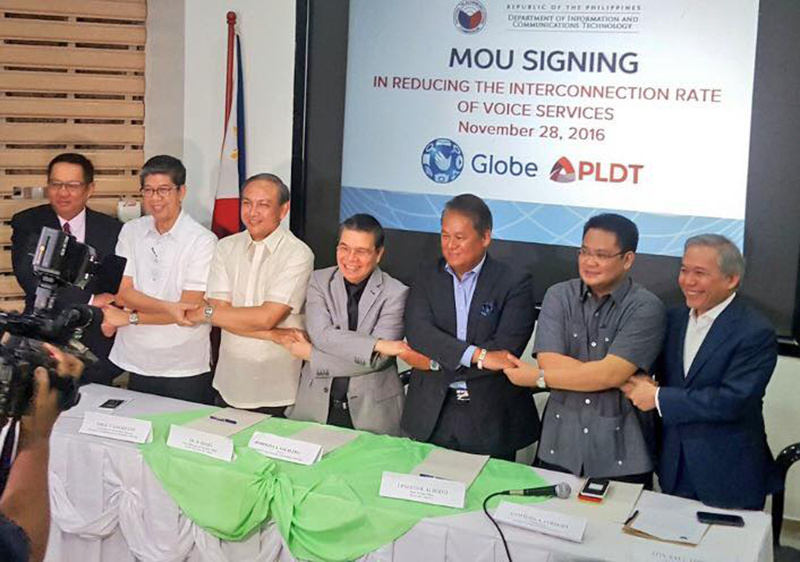 PLDT and Globe join the Department of Information and Communications Technology (DICT) and the National Telecommunications Commission (NTC) for a signing of a Memorandum of Agreement (MOU) to lower interconnection charges by as much as nearly 40% . Starting January 1, 2017, the interconnection rate for voice calls between the two telco giants will be reduced to PHP 2.5 per minute. At the moment, mobile to mobile and landline to mobile voice calls is priced at PHP 4.00 per minute while the mobile to landline voice calls cost at PHP 3.00 per minute. “We are supporting government’s efforts to bring down the cost of telecom services in the country. This agreement will translate in different ways to more affordable voice call rates for our subscribers,” PLDT Director and Head of Regulatory Affairs and Policy Office Ray C. Espinosa said. Even with the lowered cost, PLDT Chief Revenue Officer Eric Alberto said both operators are also committed in maintaining the highest quality of connection for voice calls between the two networks. This is great as Filipinos can now enjoy calls from both networks in a much lower rate! “We were the first to introduce unlimited voice calls from the PLDT Group mobile networks to a PLDT landline and between any of the mobile services Smart, Sun, and TNT. This unlimited service resulted in much lower voice call charges among PLDT’s over 70 million subscribers,” Alberto said. As a follow-up, Mr. Alberto also highlighted that the PLDT Group has actually been bringing down voice call rates through bundled services, especially in its mobile services - Smart, Sun, and TNT.